Jan Mostaert was a painter of considerable renown, primarily known for his religious compositions and portraits. His work is characterised by a minute rendering of the details in a manner that can be related to manuscript painting. The backgrounds of his works are normally landscapes and reveal the evident influence of Joachim Patinir. This painting is a fine example of his narrative skills and includes various episodes from the same story, namely the Expulsion of Hagar as related in the Old Testament. The principal image is that of Abraham at the moment of sending away Hagar and their son Ishmael. Behind this scene are various episodes in which the story continues. On the left we see Abraham’s wife Sarah, looking from her front door at the scene of the expulsion, which she instigated. On the right are various moments in Hagar’s journey including the appearance of the angel that gave them water to drink and the episode of the sacrifice of Isaac, Abraham and Sarah’s son, taking place on a hilltop in the distance. The subject of the Expulsion of Hagar was extremely popular in the Low Countries in the 16th and 17th centuries. The Expulsion of Hagar, the subject depicted in the foreground of this panel, is an episode from the Old Testament, as are the other episodes depicted in the background. According to the biblical account, Sarah, wife of the patriarch Abraham, was barren. For this reason she offered her eighty-six-year-old husband an Egyptian slave named Hagar so that they could conceive a child. Hagar gave birth to Ishmael and from that moment began to look at Sarah with disdain. Sarah, however, also conceived a son by her husband who was named Isaac. On the day that she weaned Isaac there was a great banquet at which Ishmael behaved badly, for which reason Sarah asked Abraham to expel him from their house together with his mother Hagar. This decision was hard for Abraham but he obeyed God’s command to do what his wife had asked him. On the following day Abraham took bread and a bottle of water and gave it to Hagar, taking leave of them both. This is the scene depicted in the foreground of the present panel with its full-length figures. On the left we see Abraham in dignified dress with a carefully trimmed square beard. Next to him is Hagar with the pitcher of water, the loaves of bread in her apron and the young Ishmael with a staff, holding his mother’s hand. The most important background scene, which precedes this one chronologically, takes place in front of the house as Sarah leans out of the door. In it, two boys are fighting with sticks, an episode to be found in the Apocryphal Gospels that recount how Ishmael hit his step-brother Isaac with great violence. The story continues in the desert of Beer-sheba when Hagar and Ishmael run out of water, with Ishmael sitting under a tree and Hagar at some distance from him on the ground, lamenting their fate. At that moment the angel of God appears, pointing out a well from which to fill the pitcher. These three scenes take place in the background on the right, in which the well has become a spring. In the last episode, mother and child continue on their way. Mostaert completes his story with the episode of the Sacrifice of Isaac on the mountain in the background. The artist’s narrative skills are evident in this panel, which Friedländer considered a typical and important example of his work. 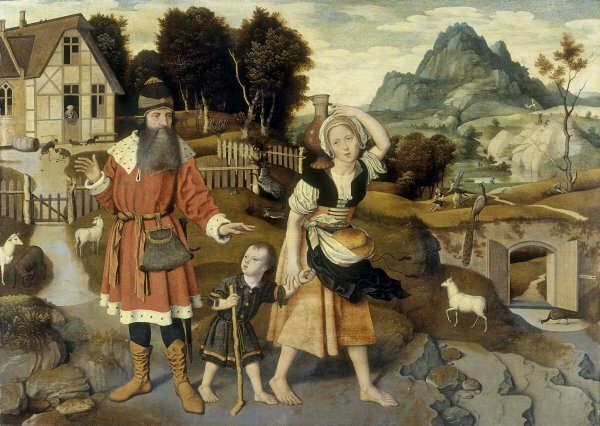 In addition to his abilities to recount a story, Mostaert’s abilities at painting landscape are also evident, with the figures inset into a landscape that has little to do with the traditional idea of a desert. It features a wide range of animals as well as striking and unusual elements such as the gateway on the right that opens onto the pathway leading into the distance. Ebbinge-Wubben drew attention to the detailed depiction of the elements in this view and considered the path, the small figures, and the shapes of the long, white clouds to be typical features of Mostaert’s style. The Expulsion of Hagar is a theme depicted in 17th-century Dutch art and has important 16th-century precedents such as prints by Lucas van Leyden and a painting now in the Gemäldegalerie in Vienna by an anonymous Dutch artist, formerly attributed to Cornelis Engebrechtsz.